This fantastic new guidebook offers a wealth of practical advice and suggestions for producing top quality images of the road transport scene with a digital camera. As well as detailing all the basic principles of digital photography and how it differs from film, the author also provides a concise overview of the different types of cameras currently on the market, basic techniques of taking the picture, and several useful tips on composition and the correct use of filters. For many enthusiasts the methods needed to make improvements to digital images using a computer are a mystery. Within this volume, the author highlights several useful corrective editing techniques using standard photo editing software available for most computers. Simple techniques of how to prepare and display photographs on the internet and how to produce prints to a commercial standard are also explained. Helpful case studies show before and after images with detailed explanations throughout. Specific examples of road transport photography around the UK are given, showing both the modern scene and examples of historic preserved vehicles, alongside screen shots to explain techniques and composition. 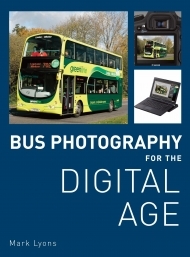 The author is an enthusiast with 25 years of experience photographing buses and coaches both in Britain and around the world, including five years of digital photography experience. He is also a regular contributor to magazines on this subject. Profusely illustrated throughout with colourful how-to diagrams and a wealth of inspirational photographs, this handy guide is a must have buy for photographers of all abilities.